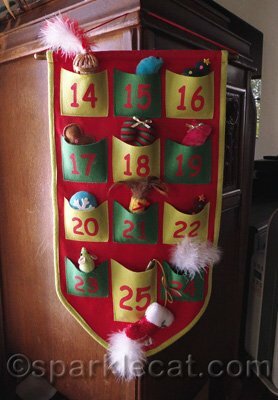 Do you remember, oh, about a year and three months ago, I received an Advent calendar of cat toys from the Petco PR humans? Well, my human finally decided to pull it out! No, this is not the permanent spot for it. What I want to know is, why does it start with 14? Where are the other 13 cat toys that should rightfully be mine? 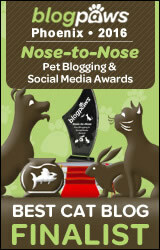 Unlike our debate over Catmas Day, I did not win this one, and I did not get my first cat toy until yesterday! Guess who absconded with it almost immediately? As you can see, there is a bell inside! In fact, a couple of the toys have bells… I bet you were wondering when I was going to get around to this week’s Photo Hunt theme! FaRADaY: wait. waaaaaitaminit. 25-14= ….ELEVEN. That’s eight more days that we gotted for Chanukah. MOMMY!!! We needs to change religions! 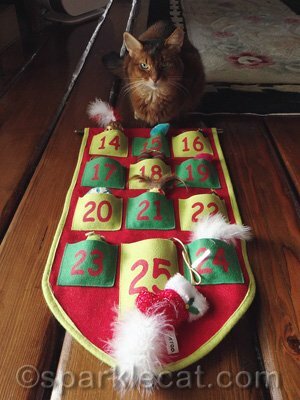 Lindo o calendÃ¡rio do advento, o gato foi esperto de escolher um brinquedo! Um abraÃ§o! 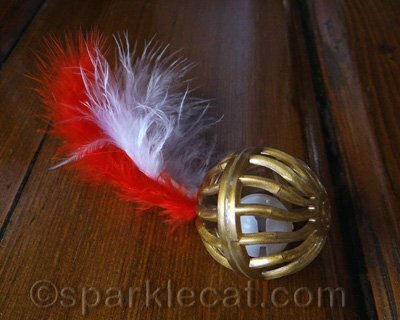 You are one lucky kitty, toys with bells indeed, hours of amusement. Shoot, Sparkle! Where ARE those other 13? Have you noticed the Human down on her hands and knees batting some fun stuff around the living room?? Nice calendar. Very convenient for a bell to be inside. 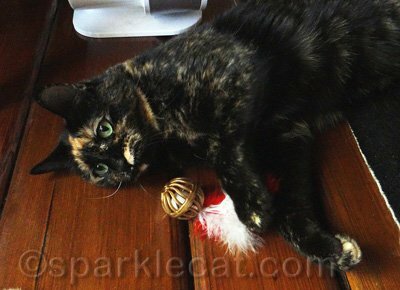 Hope you find your other 13 toys Sparkle! We love the photo of Binga with the bell! We wanna know why we don’t have a calendar like that! Sparkle, We think you were robbed! You Human should give you a toy per DAY, at least. It’s smart to recycle. Our Domino goes nuts for those balls with bells. oh that’s just not right.. You should have had 25 days.. but some is better than none, and we should be remember to be thankful for what we do have.. it is what makes Christmas Christmas..
Well, I think it’s still a very cool Advent Calendar. I’m sure you’ll get to play with a toy or two. The dog steals all of ours, poo. Purrrrrrrrrrrrrrs to you. Bells! Scooter is terrified of bells. She is an adopted rescue, so we don’t know much about her past. Kinda nuts, though. good idea, a hunt for bells. the humans here has been hunting for each and every one of teh collars wif bells they put on me. I can hide them pretty well, fank you very much. not tell tho. so good luck wif that. ps – pretty toys. how did you get to be so lucky? hmmm… maybe a reference to 12 days of christmas? Hmmmmm….what did happen to the other days????? In spite of that, it’s a great advent calendar!! Well 12 toys are more than I’M apparently getting. I’m still looking for a way to return the orange monster to the North Pole. 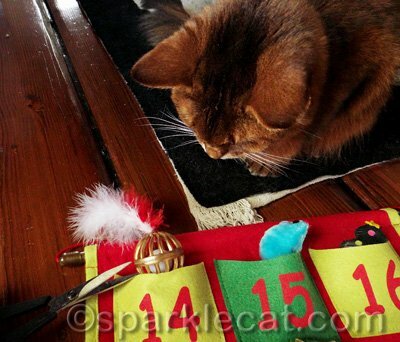 A cat advent calender, now that’s very posh !! My cats are jalous ! BTW the only trouble with the fur is that there is no zip for the summer ! That sure is pretty, and the bell thief might end up on the naughty list! That is a pretty darn great advent calendar Sparkle. Glad the Mom pulled it out for this year. Hope you get your bell back from Binga. Take care. 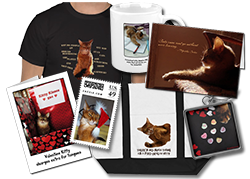 Ohhhhhhhhhhh, how so very PURRfect for those purrecious kitties. I do so adore cats.